They aren’t called UCFast for nothing. The Knights play at one of the fastest paces in college football and have the players at the skill positions to make it work. They currently average 43 points per game and scored 38 against Cincinnati, who hadn’t given up for more than 30 in the six games previous. The list of contributors offensively is exhaustive. Six different players caught at least one pass and five different players ran the ball at least once. In his first season as head coach, Josh Heupel has carried over some of the spread principles that he used in Oklahoma under Bob Stoops. 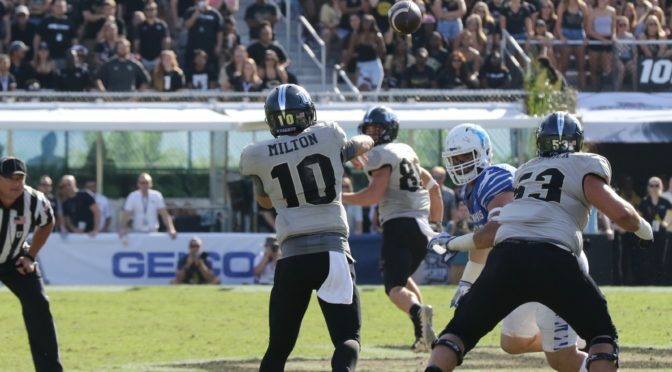 Junior quarterback McKenzie Milton (5’11, 185) isn’t the prospect that Sam Bradford was coming out of Oklahoma under Heupel’s tutelage, but the UCF quarterback is putting up reminiscent numbers. The Knights will need a lot of help to get into the College Football Playoff but even if they don’t make it, their offense will pose a big problem to any Power 5 team because of the one-on-one matchups they can create week-to-week. Davis, pictured, has 15.5 tackles for loss for the Knights entering the team's AAC Championship Game. 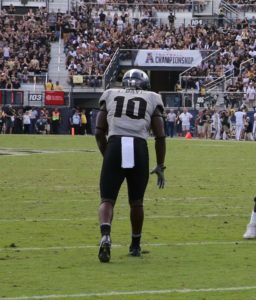 Senior defensive end Titus Davis (6’3, 250) and junior defensive end Brendon Hayes (6’3, 293) are two premier pass rushers who feast on opposing quarterbacks once UCF takes big leads. The two tag- teamed for a turnover in the second quarter, when Davis met Cincinnati freshman quarterback Desmond Ridder (6’4, 212) in the backfield, forcing a fumble that Hayes recovered. For the game, Davis finished with three sacks, bringing his season total to six. Hayes, the better edge-setter and run defender between the two, had five tackles and a pass deflection. Before the Bearcats could settle down, they were already in a hole. In the first half alone, the Bearcats lost a fumble, missed a field goal, had a field goal blocked and missed an extra point. "We generated some momentum early in the game and gave it right back to them, whether it was a missed field goal or extra point or something like that," Cincinnati head coach Luke Fickell said. "When you're playing the champs, when you're playing a team as good as they are, you can't have mishaps like that." For the game, the Bearcats were comparable when it came to total yards and third down efficiency. But the early lopsided score made the Bearcats one-dimensional and turned what could have been a close game into a blowout.